Today's adventure in the freezer produced a pound of ground lamb and a package of Hawaiian rolls. Hmmmmmm. 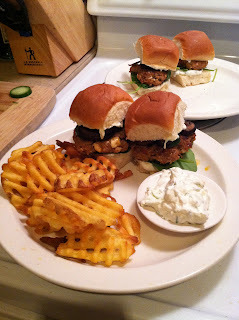 What to do...... SLIDERS! I didn't want anything too difficult because it was during the week. I mixed the thawed lamb with grated white onion, ginger/lemongrass paste, salt, pepper, feta cheese and a teeny little glass bowl of marinara I found in my ice box. I made 8 slider patties from one pound of mixture. I decided to fry them in a cast iron pan. After the lamb patties were done, I added onions and mushrooms and sauteed them until they were soft. While they were cooking down I made some Greek sauce out of some homemade plain yogurt, grated cucumber, onion juice, garlic powder, Greek seasoning and about a tablespoon of mayo. I put some frozen waffle fries on a baking sheet and put them in a 450 degree oven for about 12 minutes. At the end of the cooking time, I added the Hawaiian rolls and toasted them. To construct the sliders, I put the bottom roll down, topped it with some Greek sauce, a few spinach leaves, a lamb patty, then some sauteed mushrooms and onions and the top roll. These were amazing! The Greek sauce made a great dip for the fries as well!